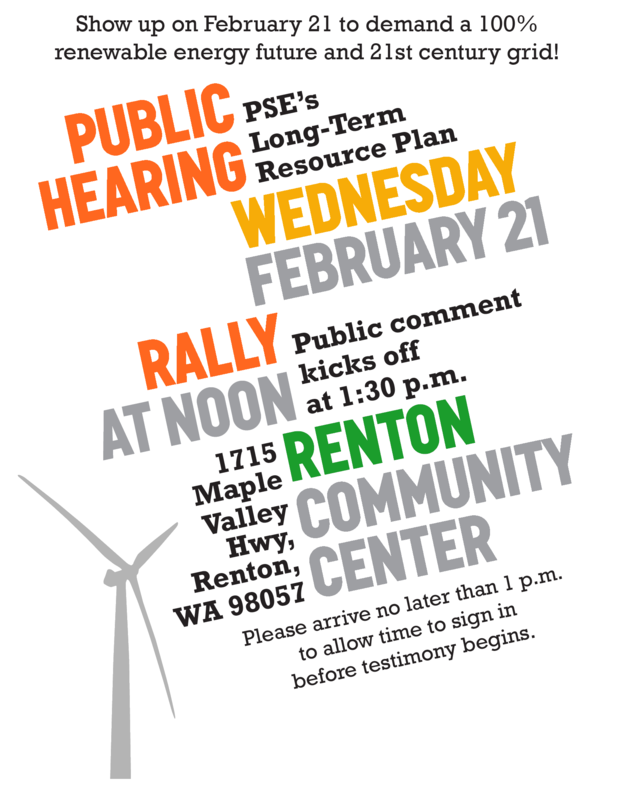 On Wednesday, Feb. 21 from 1:00-7:00 pm in Renton, the Washington Utilities and Transportation Commission (WUTC) will hold a public hearing to gather feedback on PSE’s Integrated Resource Plan. This plan will guide energy infrastructure investments for the next 10-20 years. Unfortunately, it is an awful plan, filled with fossil-fuel energy, dangerous transmission lines, and continued operation of one of the dirtiest coal plants in the country. Please let the Commission know what you think! The opportunity to comment comes only once every two years, and customer feedback can make a big difference. Help spread the word! Download, print, and distribute this flyer! Sign up on the Facebook event page and share with friends. Cant make it to the meeting? Please send your written comments to the WUTC. Details below. PSE’s 20-year plan is a blueprint for locking WA into decades of fossil fuels and an outdated energy grid. Instead of investing in renewable resources, energy storage, and other modern solutions, PSE is wasting $1 billion of ratepayer dollars in coming decades on “Energize Eastside” – an obsolete and unsafe transmission line through Eastside neighborhoods that only benefits the company’s bottom line. Puget Sound Energy is sacrificing Puyallup Tribal land, community safety, and customer money for a liquefied natural gas (LNG) terminal in Tacoma that we do not need. PSE plans to operate its Colstrip coal plant—the largest source of carbon pollution in the NW—until at least 2035. PSE intends to build over 700 MW of new fracked gas plants over the next 10 years and has already secured the permits necessary to begin construction. Whether or not you attend the hearing, please consider submitting written comments. Detailed, fact-based comments are always best, but not necessary. Brief comments expressing your feelings and opinions are also very helpful. Deadline for written comments is February 22, 2018. See our WUTC comment writing guide to help formulate your comments. The docket numbers of this proceeding (UE-160918 and UG-160919). The Commission will post on its web site all comments that are provided in electronic format. Please refer to Dockets UE-160918 and UG-160919 to ensure that you are placed on the appropriate service list.